stopping off at a country pub for lunch and a chilled glass of Sauvignon Blanc. One woman’s journey to find herself and help secure the vote. Perfect for the fans of the TV series Mr Selfridge and The Paradise. 1911 Bath. 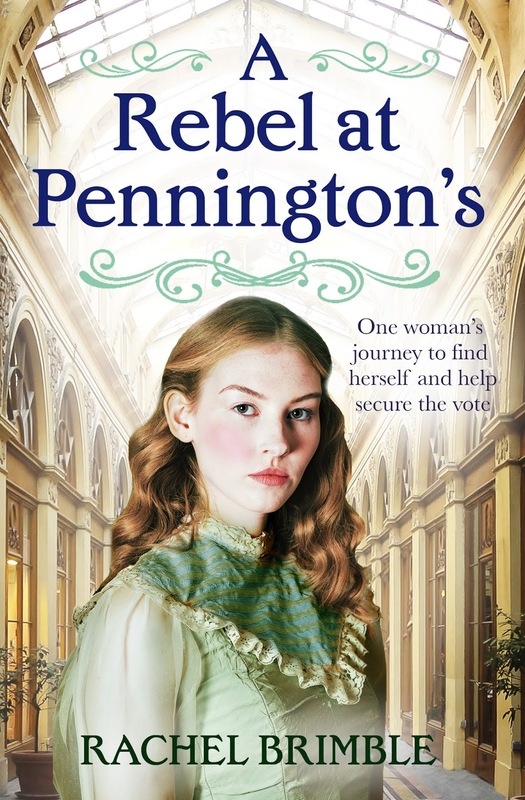 Banished from her ancestral home, passionate suffrage campaigner Esther Stanbury works as a window dresser in Pennington’s Department Store. She has hopes and dreams for women’s progression and will do anything to help secure the vote. Owner of the prestigious Phoenix Hotel, Lawrence Culford has what most would view as a successful life. But Lawrence is harbouring shame, resentment and an anger that threatens his future happiness. When Esther and Lawrence meet, their mutual understanding of life’s challenges unites them and they are drawn to the possibility of a life of love that neither thought existed. With the Coronation of King-Emperor George V looming, the atmosphere in Bath is building to fever pitch, as is the suffragists’ determination to secure the vote. When her mother had passed, Esther’s father had mistakenly believed his daughter would give up the fight.How very wrong he had been.Now, thanks to the poison Esther’s stepmother had slowly dripped into her father’s ear, Esther found herself living away from her familial home in the Cotswolds and, instead, in the centre of Bath with her aunt. Although Aunt Mary certainly sided with her brother and his new wife about Esther’s activities, at least she had somewhere to stay and was now more active than ever as a member of a bigger and more determined suffragist group. She hurried along the street, passing stalls selling flowers, fruit and vegetables, as she made her way through the slowly increasing crowds. Inhaling the scents of horses and petrol as carriages and shiny, new motorcars swept by, Esther took little notice of the goings-on around her, her mind so full of thoughts and distraction. There had to be more the Society could do. Anticipation her fellow campaigners might support her new poster designs, not to mention other strategies she’d put forward, gave Esther a much-needed injection of hope, but it still wasn’t enough. Again and again, they acknowledged her creative talent. Had even commented that her position as head window dresser at Pennington’s could serve them well in the fight. But there had to be more she could do. 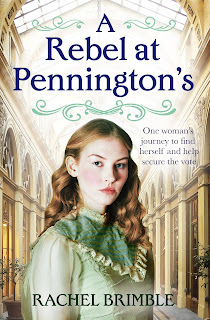 Nerves leapt in Esther’s stomach as she battled her guilt over the growing temptation to leave the suffragist group and join the suffragettes. The differences between peaceful campaigning versus militant meant publicity for the Cause was becoming feverish. Her allegiance to the Society, and her fellow campaigners’ approval of her enrolment, meant she had finally found her true place in the world. That she was valued and needed. But she could not allow their lack of progress to assuage the fire that burned deep inside of her. booted toes. She neared the building, the mid-morning sun teasing her senses with the promise of summer. Esther breathed deep and stared at Pennington’s façade. Painted entirely white, with two tall columns flanking the gilded double doors, Bath’s finest department stretched to five storeys and encompassed everything a consumer could wish for. From hats and gloves, to jewellery, toys and perfume, Pennington’s was a store that inspired and influenced. A promised land where people from every walk of life came to shop, take lunch and socialise. Esther stepped forward… only to stop again.A man stood in front of one of the store windows with a little girl and, judging by the scowl on the girl’s face and the exasperation on the man’s, father and daughter were in the throes of debate. He arched an eyebrow, the exasperation in his eyes softening to amusement, which only hitched Esther’s temper higher. Her smile faltered as she struggled to maintain a semblance of pleasantness.